Happy Birthday Darling! Today, I celebrate THIRTY years of being alive... what a blessing. So, I didn't celebrate turning thirty with the all white party, I loosely envision, partly because my friends and family don't live in my town and I felt a bit nostalgic. Instead, I went on a gratefulness walk with my son at one of my favorite local parks, and we had a nice family dinner at Old Mill. I wanted to commemorate turning thirty by sharing some important life lessons I have learned along the way. Things do happen for a reason and life makes sense backwards. God + The Universe have your back. Trust the journey. Things do not bring you lasting happiness + contentment; inner peace does. Gratitude will change your life. Your heart will feel so full when you truly appreciate what you have. Trust your heart. It is your compass. Be open to change. Resistance to change creates a while to of pain. Not knowing is perfectly okay. The answers will come to you when the moment is right. Accept what is and let go of the rest ... it’s so easy to get down when our present is not playing out how we wanted or expected. Just let go. Surrender. Tell people what is in your heart without fearing how they will react. It's liberating. Don't take things personally. When someone treats you poorly, it's all a reflection of their life and the struggles they are facing. Be kind to everyone. Be warm and welcoming... just like my great-grand-ma "mama". Nothing lasts forever. Embrace each season of life. Take all the good and all the lessons with you. Ask why and listen. Really listen. Asking why is the first step to creating common ground/understanding. Embrace the now. Nothing is ever the same and nothing will ever be the same. Today will never be again. Process your emotions. Take the time to feel what you're feeling and than release. Learn from your children. They come into your life to teach you more than you could ever teach them. They are pure and their inner compass has not yet been recked by parental or societal expectations. Your example speaks for itself. It's louder than words. Take care of yourself first. An empty vessel can't care for or nourish others. The work we do within is the most important work we can ever do. Take ownership of your life. Take ownership of your contentment. Don't grant anyone, but yourself the responsibility of your happiness. Be you. You are enough Darling! Cheers to my thirties! May I continue to love, learn and grow. By no means are we travel experts, but we have done our fair share of travel over the years and having a child has not stopped us from traveling. Allan and I enjoy traveling + discovering new places and we want to continue embracing adventure as a family. I personally LOVE traveling with my family because it allows for lots of opportunities for quality and bonding time. Having a child slightly changed the way we travel, in the sense that, we are a bit more thoughtful + planned. Traveling with children does take a lot more work, but we feel the extra work and planning is worth the while. Planning ahead of time, has allowed us to enjoy our travels more, has reduced or taken away any unnecessary stress, and has allowed space for more spontaneity + going with the flow. Traveling with Alexander has been super fun + rewarding and has allowed me to slow down a bit more and appreciate things that I (otherwise) would not have appreciated... and I just love experiencing the world from my child's perspective. Back in April, we visited London and Paris. To get ready for this trip, we did quite a bit of research (and by we, I mean mainly Allan... he really enjoys that stuff and he is a natural at it). Our trip was a week long. Our goals were to pack as light as possible, to explore as much as we could, and to juice each day to the fullest... and we managed to do just that. Today, I share with you, our travel tips and the things that worked well for us while traveling with our toddler. Alexander was almost two years old back in April. 1. Choose And Research Your Destination || When you choose your destination, do a little bit of research to determine what you will need to bring for your child. Will you find the organic whole (shelf stable) milk you like? Or should you bring it with? Depending on your destination, you may be able to get away with only packing the foods, diapering essentials and the other necessities that you will need for the travel-day + an extra day or two of supplies... and if the city you are visiting allows, consider purchasing a lot of the things will need there... especially if you are taking an extended vacation. But, when in doubt, bring all the essential that you will need for your child... it will make you feel more at ease. 2. Allow Extra Time On Your Travel Days || Consider booking your travel days on a Saturday or on a non-work day. Initially, I wanted to flight out on Friday night after working all day/week (I really wanted to squeeze in as much time as possible), but Allan insisted we fly out on Saturday instead and here is why... this allowed us to get a good night of sleep after a long work-week and wake up refreshed the next morning. This allowed us to enjoy Saturday as a family and make our way to the airport (1 hour 45 minutes for us) without rushing or stressing... a win-win for us. We also allowed plenty of time to go through security and make our way around the airport without rushing... this is particularly helpful because, our kids pick up our vibes, and if we are stressing, they will also get stressed and the likely hood of having a grumpy child increase. Instead of stressing about the travel, make it an adventure for you and your child. We also booked our return-home-tickets on Saturday... again, this allowed us to get a restful night of sleep at home, wake up slow on Sunday morning, and have an extra day at home to relax, be lazy (take naps) and prepare for the week ahead. If traveling on a Saturday doesn't work for your family, just allow extra time on the travel days, maybe take the day off, maybe work from home or plan to leave work early. Regardless, of what days you travel, allow a day off after the travels (especially if you crossed multiple time zones) to relax prior to starting a new work + school week. Your body + mind will thank you. 3. Book A Red-eye Or Non-stop Flights || If available, book a red-eye or non-stop flights. We flew out of Minneapolis at 9:50 pm, local time, and this allowed us (mainly Xander) to get some sleep on route. We got to London at 12:30 pm, local time. We caught our train to the hotel, got settled into our room, and headed out to explore the city. We explored and enjoyed a meal out, without feeling like we wasted that day. We went to bed relatively early that day and got some much needed rest, woke up rested the next morning + ready to enjoy the day. We noticed none to very little jet lag (despite the 6 hour change in time zone) and I attributed this to the red eye flight. 4. Choosing a Hotel or AirB&B || We stayed in a hotel, central location in London, within a few blocks of Paddington Station. We chose a hotel because we also wanted to visit Paris for a couple days and we wanted to leave most of our luggage behind. We left most of our luggage in a storage room at the hotel. We retrieved our luggage, when we rechecked back into the hotel after returning from Paris (most hotels can accommodate this as a curtesy or for a minimal fee). The hotel also provided us with a crib for Alexander to sleep, so we didn't need to haul our pack&play around. For this trip, a hotel worked best for us, but we also see the appeal of an AirB&B. And because hindsight is always 20/20, having a living area separate from the sleeping area would have been super nice... to allow an opportunity for a glass of wine and conversation after Xander went to bed. Typically, booking an AirB&B, means more space... more room to spread out... potentially having those separate spaces (bedrooms + living area) at a cheaper rate than booking a bigger hotel room. If you are traveling for an extended time, booking an AirB&B, will almost always be the best option... especially if you will be prepping meals-in and need a kitchen. Also, booking an AirB&B that has a washing machine will make packing light so much easier, especially, if you are traveling for more than one week. An AirB&B would also be more relaxed and feel a like a home away from home. We see advantages to both hotel rooms and AirB&B's and because every vacation is different and every child and family is different, make this decision based on your wants and needs. 5. Outline Your Days || Make a list of the things you want to do and outline your days. Notice, I said outline, not plan your days. Outlining a day ensures that you get to the places you must, but also allow time to leisurely explore without having a rigid schedule to follow. We allowed extra time for meals, and unplanned adventures or mishaps. Loosely planning our days, allowed us to also be spontaneous and have space in the day to go with the flow... again reducing any potential for stress. Because we outlined our days, we knew we wanted to go to the Louvre first thing Thursday morning, so we block off the morning for that, had mid-day lunch, and left the afternoon open for leisurely explore as we strolled back to the Arc de Triomphe in the direction of our hotel. Even though our trip was only a week long (not enough to explore these cities) we jam packed it with sights and things we wanted to see + experience, but we also left chunks of time to just freely explore and vibe with our surroundings. 6. Pre-purchase or Pre-book Tickets || Pre-purchase/book tickets in advance for the things you know you really want to do... this allowed us to enjoy ourselves more because we didn't have to spend time (stressing) figuring things out last minute. Besides the plane tickets and booking your room or air b&b/, also consider pre-purchasing public transit cards or booking a rental car (this will depend on your destination). We pre-purchased Oyster Cards for Allan and I to get around London (this is a must if traveling to London, this allowed us to use trains and buses all around the city) and we also pre-booked an express train to take us from the airport to paddington station. Also, pre-book any tours that you know want to do... we booked a day long trip to Windsor Castle, The Roman City of Bath, and Stonehenge. We also pre-purchased train tickets to and from Paris, and tickets to the Louvre. Even if you don't pre-book, do some research ahead of time... this will save you some hassle, headaches, and waiting in cues. 7. Pack Light || We didn't want to feel weighed down by luggage, so our goal was to travel light, but yet bring all the things we needed. My biggest tip here, is to plan your outfits for each day based on the weather, the things you want to do, and the modes of transportation that you will use. Also, plan your shoe selection around that. A huge goal of ours was to pack light, so I only brought 1 pair of black booties-- these were super comfortable, allowed me to walk all day long and they went with all my outfits. On that same note, dress in layers. Dressing in layers is the best way to ensure you will be comfortable when your traveling to a place where the temperatures are ranging. Also pack versatile items that will do double or triple duty. A scarf would be one of those super versatile pieces. And if visiting Paris, alway bring a compact umbrella to keep with you at all times and a light jacket if you visit in spring. 8. Bring Ready To Eat Snacks || Snacks are must when traveling with children. Xander was obsessing over Cuties (small mandarins) at the time, so I packed a zip-lock bag full of pre-wash Cuties, super easy to peel. We also brought fruit pouches, snack bars, and shelf stable milk. We also brought almonds, walnuts, and dehydrated apples --mainly for me, but Xander also enjoyed those. Another great snack to pack are energy balls (click here to see my recipe). Though, I didn't get a chance to make and pack energy balls for this trip, they are a hearty, nutritious, + delicious snack to pack. Also, bring a water bottle that you can refill after going through security or purchased bottled water... its super important to keep children (and adults alike) hydrated when traveling by plane. Also, ensure to have snacks and water on hand all the time while on vacation, this will avoid any grumpiness due to hunger or thirst. 9. Travel With A Large Hand Bag or Tote || We decided to bring a large tote --it was light and roomy enough for diapers/wipes, snacks, water, Xander's activity pack (a few board books to read, a coloring book, smaller toys), my magazine, Xander's noise reducing headphones and the iPad. Basically, things that you will need within arms reach. Also bring a carry on to pack the other things that you may need while traveling, e.i. extra diapers, snacks, a light jacket, a change or two of clothes, your camera, lab-top and anything that you may not want to check. 10. Bring A Compact Stroller || A stroller is vital... especially, if you plan to do tons of walking and want to have a place for your child to nap even when you're on the go. Xander took all his afternoon naps in the stroller while we were on the go. Ensure your stroller is compact, strong enough to withstand the travels, and also reclines. We have used this stroller in all of our travels with Alexander and its worked really well. It's light, easy to maneuver and comfortable. Also, bring a blanket to keep with the stroller to use when your child falls asleep, as a cover if the elements change and if your child needs some extra layers. Another Item you should consider bringing with you is a carseat. We did not bring a carseat for this trip because we knew we would be using public transportation, buses and trains. However, if you plan on traveling by car while there, bring your own carseat or rent one from the car rental place. 11. Bring An Activity Pack For Your Toddler || Put together and bring an activity pack for your child. It could be anything from board books to read, a compact coloring book + crayons, smaller toys -legos, cars, a doll - whatever your child is into at the time. We placed all of this items in a bigger pouch and kept it within arms reach inside my travel tote. 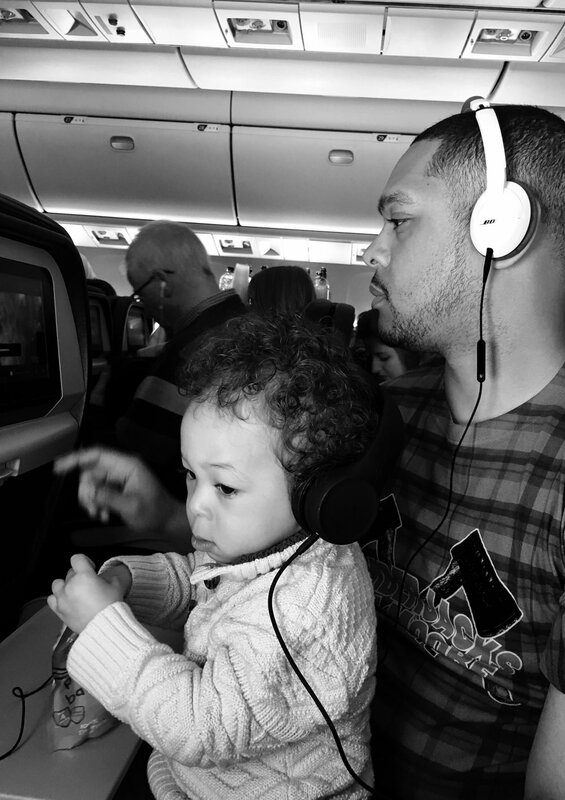 We also brought a tablet and headsets for Xander to use on the plane as a measure of last resort -- for those moments when everything else fails and we need to keep him entertained ... and perhaps prevent a melt down in such tight quarters... the tablet will likely do the trick. We downloaded shows we knew he would enjoyed. 12. Get Organized For The Next Day's Adventure || Get organized for the next's day adventure the night before. Pack your bag with snacks, water, diapers, a layer, a change of clothes, etc. Also, put aside the clothes that you and your child will wear the next day... When you get up in the morning, it's just a matter of getting ready and getting out the door. No waste of mental energy and no rushing or stressing-- all essential for me while on a vacation. Traveling with children does take a bit more planning, but it's so fun and rewarding. I personally LOVE traveling with my family because it allows for a lot of opportunities for quality time, bonding, and conversation. Hope these ideas are useful to you as you plan your travels. We arrived to Paris mid-morning on a Wednesday. We only spent about 32 hours in Paris... just enough time to fall in love with the city. As cliche as it may sound, Paris is soo lovely. The city exudes a romantic vibe... and I totally think the architecture plays a role. Upon our arrival, we met a family friend for a delicious Thai lunch and great conversation. After lunch, we headed off to see the Eiffel Tower... Our first glimpse of the Eiffel Towel was from Palais de Chaillot, just above Jardins du Trocadero. I was in aweee!!! This beauty is soo elegantly striking... It must be seen in person. I admired, admired again, and kept admiring... I was literally pinching myself... I was so static to be there. We took the classic pictures, made our way down to the gardens, by the carousel, Alexander did not want to ride the carousel; we bargained for souvenirs, and eventually we crossed over the Siene River. The closer we got the Eiffel Tower, the more magnificent it seemed. After much admiration, I finally broke away... We continued exploring the city on foot. We walked for miles... I was in heaven. We blocked off Thursday morning to explore a little bit of the Louvre, we saw the Mona Lisa; had the flakiest, most delicious croissants + espressos at a cafe inside the Louvre; we explored some more, and then headed off to lunch at a lovely cafe at the Tuileries Garden (right next to the Louvre). After lunch, we didn't really schedule much of anything because we just wanted to leisurely stroll the streets as we made our way back to the hotel before heading back to London that evening. And we truly had a lovely time, after lunch we spent sometime at the Tuileries Garden, watched Alexander be mesmerized by the pigeons that were gathering by the fountain, also looked for cover to flee from the passing winds + rain that came out of nowhere. We perused the shops around The Big Wheel at Place de la Concorde just outside Tuileries Garden, got crepes from a street vendor, and we strolled up Avenue des Champs-Élysées as we headed up to see the Arc de Triomphe... this stroll is just beautiful. We got caught in the rain again, went into a few of the shops, and sat down at a cafe for coffee and macaroons. We saw the Arc the Triomphe up close and lesurely strolled back to the Roosevelt to collect our luggage. This super short stay in Paris was a tease... I look forward to spending more time here. I look forward to sitting outside a cafe... sipping on a latte, watching the city go by; packing a picnic + heading to a park, and strolling the many streets of this city... as every street pulls you in with its charm... perhaps exploring other parts of France too. In the meantime, I've got my work cut out...trying to convince Allan to return back to Paris.